Micro-learnings are frequent, bite-sized boosters that provide the user with highly targeted content. It has been clinically proven that learning small pieces of information at a higher frequency gives much better knowledge guarantee. Because of technological development, the world is changing faster than ever. This also leads to a transformation in labor. Employees must continuously gain new knowledge. Going to a training a few times a year nowadays is simply not enough. Micro-learnings are the perfect solution. Micro-learning makes learning more meaningful and engaging, through the use of short and easy, one-on-one lessons. The enormous growth of smartphone use in the professional environment makes micro-learning the perfect learning and development solution for all employees. The user is offered micro-learnings in his dashboard based on his own scores. 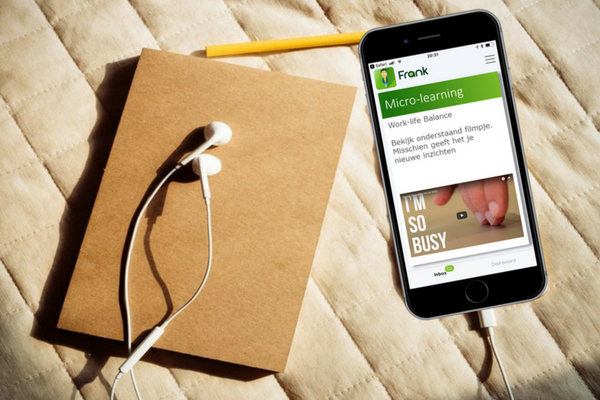 The micro-learnings are available anywhere & anytime. In addition, micro-learning can be offered just-in-time to the entire organization, or a part of it. For example for the rollout of a new software system, or repeating core values ​​of the organization.